Brutal gang warfare in the 41st millenium. The original version of Games Workshop’s Necromunda is one of my favourite games of all time, so it was with trepidation that I heard of the new version, and then with utter horror that I learned the boxed game was a 2D version played on flat tiles. That’s not Necromunda! But fear not: it’s just a bit of tricky dicky Games Workshop sleight of hand to get you to buy another book separately with the 3D and campaign rules that, you know, basically make Necromunda what it is. I could whinge about things like that, and the separate gang cards, the division of rules into multiple ‘Gang War’ books, the errors that need a FAQ and errata, but hell, you know the drill. Thankfully, they didn’t change too much with the new version and its still pretty much the game we all knew and loved, albeit with a little bit of rules streamlining. Though of course you still roll scads of dice: roll to hit, roll to wound, roll an armour save, roll an ammo die, roll an injury die … this is Games Workshop and that’s not going to change! In fact, despite the very nice new figures, there really is no compelling reason to get the new version if you have the old one. 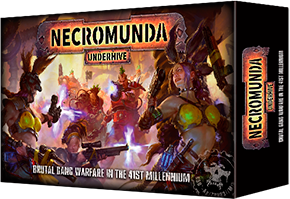 Not many people still do however, so if you like a bit of old school sci-fi gang warfare, grab the boxed set and the damn over-priced Gang War book and get thee hence to the industrial underhive. Just don’t bottle out! Oh and by the way, this summary includes the 3D rules from Gang War but not the campaign rules. Because if I did include more, GW lawyers would probably be on me like rust on an underhive gangway! PS: My thanks to Rodney Smith of the fantastic Watch It Played!, who generously gave me his typed rules summary notes and allowed me to use them as the basis for my work. Thanks Rodney! Orlock gang and Gang War 2 are available for pre order now. $71 for the figures, $26 for the cards, $50 for Gang War 2 = NZD$147 to use a new gang in the game (official retail is even more). I’m really annoyed at these piecemeal purchasing tactics, and those prices are ridiculous. Sounds worse in your money. Divide by three to get UK price in pounds. Just out of curiosity : the original Necromunda has (had?) a very active community that came out with their community inspired rules after GW stopped publishing the original game. Can I use those publicly available rules and get the new minis to play the game with? I never played original, but I think UH said not that much difference. But the plastic figures won’t know you’re using or rules, so I’d say yes. Although if you want to play competitive (I play for fun) then you will need current rules. Now that I have painted core box of Mythic Battles I might take a break and paint Necromunda… or Wild West Exodus… or Star Saga… or Deadzone… or Fireteam Zero… or Endure The Stars… or Conan… or Bloodbowl…. Van Saar and Gang War 3 coming to pre-order next week.